Although we do everything to prevent machinery malfunction, experience learns they sometimes happen anyway. In this case, repairs are only useful when the cause of the malfunction is exactly known. Without a thorough analysis, the problem is likely to occur again. By trouble shooting the problem, we can quickly identify the root-cause of the problem. 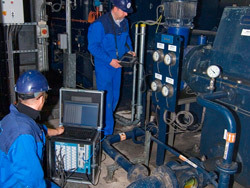 Our unique combination of experience, knowledge and modern equipment guarantee a correct and quick analysis of acute problems, an as short as possible downtime and a very small change for reoccurrence. 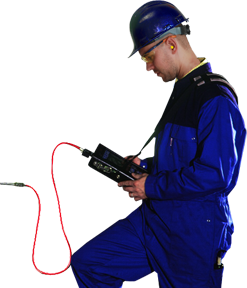 On top of the vibration analysis services above, we also offer high resolution Thermal Imaging and Bearing damage analysis. 24/7, 365 days per year. That's service! It often goes wrong on the most inconvenient moments. This requires flexibility from the specialists that support you by finding a solution. Van Geffen VMS guarantees this flexibility: 24 hours a day, 7 days per week and 365 days per year. We always have time to prevent downtime. Our company is SCC (VCA) certified and we work according ISO standards. Our specialist are NOGEPA, OLF and OPITO certified and posses all necessary papers to safely work on board ships, construction barges and oil- and gas rigs.